Home / world / Kingdom,US agree: Assad should have no role. Kingdom,US agree: Assad should have no role. Custodian of the Two Holy Mosques King Abdullah and US Secretary of State John Kerry held wide-ranging talks on Monday that focused on key bilateral and regional issues, with special reference to Syria, Iran and the Middle East peace process. Concerns over continuing Israeli settlement expansion, a flawed American foreign policy and an urgent need to restore peace and security in the Middle East region were also raised in talks. King Abdullah discussed issues that have divided opinion among senior US and Saudi officials. The talks were attended by Crown Prince Salman, deputy premier and minister of defense; Prince Muqrin bin Abdulaziz, second deputy premier; and Prince Saud Al-Faisal, foreign minister, and high-ranking Saudi and US officials. Addressing a joint press conference with Kerry after talks with the king, Prince Saud said that the Kingdom and the US are “friendly countries” with a relationship based on “sincerity, candor and frankness”. Saudi Arabia, he said, is an important diplomatic and trading partner for the US. Both leaders agreed that there should be “no role” for Syrian President Bashar Assad in any transitional period. Prince Saud demanded Iran leave Syria, saying that Tehran was helping President Bashar Assad to strike and kill his own people. He said the proposed talks to end Syria’s civil war could not happen without the participation of an opposition coalition leading the struggle to oust Assad. “Assad has lost all legitimacy, and he must go,” said Kerry. Prince Saud expressed deep frustration with the UN, where the Kingdom recently rejected a seat on the Security Council because of its inability to achieve progress on Syria, Palestine and other issues. Kerry acknowledged that the region is rocked by the turmoil of the Arab Spring, which is reshaping the geopolitical landscape. 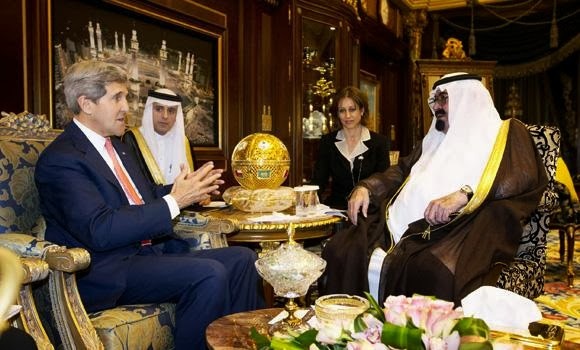 Kerry said Saudi-US ties are “strategic” and “enduring”. There were “no differences” between them on Syria, Kerry said. He praised the Kingdom as “the senior player in the Arab world.” Washington and Riyadh shared many current concerns, he said, highlighting the difficult transition in Egypt, the war in Syria and Iran’s nuclear ambitions. He also assured that Iran “will not acquire a nuclear weapon” and that America will not abandon its allies. He reiterated that the US will not allow those countries to be attacked from outside. Kerry was in Saudi Arabia on the second phase of a 10-day tour through the Middle East, Europe and North Africa.